The focus I will be taking with my autoethnographic study will be Japanese video games which can be played on a portable gaming platform. I’m choosing games which can be played on a portable platform purely to help narrow down the options. I will play a new game each week and talk about my experiences with them. However, today I want to recall an experience I had playing a game which, until recently, I didn’t know was Japanese. Back in early 2007, when I was 13, I had a game on the PSP called ‘Me and My Katamari’. I had no idea exactly a ‘katamari’ was (apparently it just refers to the sticky ball you roll around in the game), or where the game came from, but I quickly found that I loved it. It was a really new experience for me as I had never really played a game like it; though I don’t mean I’d never played a Japanese video game before, because I had (and I watched my brother play ‘Final Fantasy‘ more often than you’d think). 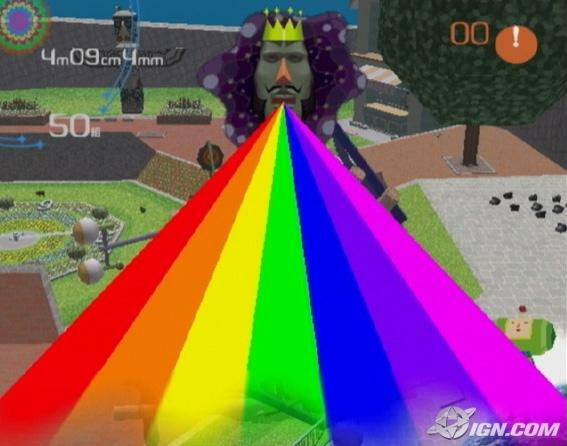 The Katamari Series was produced by the Japanese company Namco, and consists of 6 main games over a variety of gaming platforms. The general idea of ‘Me and My Katamari’ was to roll up items on Earth to rebuild islands for some homeless animals. Sounds a bit strange, and to be honest it was. The colours were bright and everything was a bit in your face. The celestial Royals (pictured below) were the oddest beings I’d ever encountered in a video game. They created magical winds and spewed rainbows. There were times when I didn’t really understand what I was supposed to do in the game, but I kept playing because I wanted to beat the clock or make an even better island made of snacks and trees. I would get really frustrated when I couldn’t complete a level, but I would work at it. I would figure out a way to get my Katamari as big as possible as quickly as possible. I suppose that was really the aim of the entire game. And while it does sound a little pointless if you say it like that, I really enjoyed ‘Me and My Katamari’, and played it constantly. After I play all of the other games I have lined up for this autoethnographic study I am going to go back and replay ‘Me and My Katamari’ to see what it’s like 7 years on. I’ll compare my experience replaying the game to my experiences with playing all the other games for the first time. I have a feeling I will notice a lot more replaying the game, but I am wondering how it will make me feel the second time round. Also it will be interesting to look at what I bring to the experience. ← How do I sign up? Hey Gabi, your auto-ethnographic study sounds really interesting. It will be good to compare the different games and see how similar/different they are in terms of your experiences and interactions. You raised a really good point about how when you first played the game when you were younger, you didn’t know about its ties to Japanese culture. I remember my brother and I were into Pokomon and Dragon Ball z when we were kids and we had no idea about their ‘Asian’ cultural roots. Just a suggestion, maybe you could talk to people who played the particular games which you are planning of studying and see what their experiences are now and what they were like when they first played them as kids. Your personal experiences really add to this post and make it really interesting. I really enjoyed the part about you saying that you didn’t really understand what was happening but you kept playing anyway, I know this is true with so many games, let alone a game in a different language. The photos you added are funny and really help in your post as it shows us what you are seeing in the game.